After a rather mysterious parting of the ways last year, Spandau Ballet will unveil new frontman Wild at a major London concert tonight. From 7.45pm fans will be able to tune in and watch a live backstage stream. Hosted by Pips Taylor this unique event will give global fans a VIP backstage pass to Spandau Ballet’s only UK gig of 2018. The live stream broadcast will include an exclusive interview with the band, a chat with some of Spandau’s superfans (who have flown in from around the world to be in London), and a preview of the soundcheck. There are even rumours Boy George might be there too..
Spandau Ballet made a rapturous return to the stage introducing their new singer Ross William Wild at a very special club show at London’s Subterania in June. Now fans worldwide will be able to get a proper look at the new line-up as they prepare for the official relaunch. 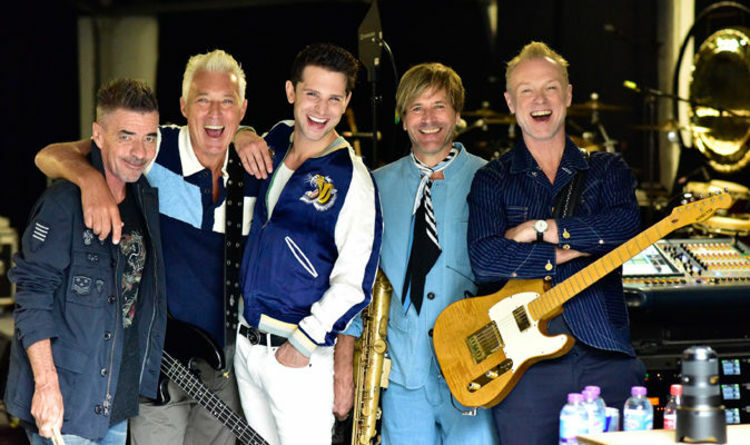 Tony Hadley and the band officially separated on July 3 last year, and when the time came to re-group it was clear to the boys after after one rehearsal that Wild’s voice and their music was the perfect fit. The band can’t praise the former musical theatre star highly enough. As for the man, himself, Wild can’t quite believe his luck. He told Express Online: “Spandau’s music is so current. Having listened to it from a young age and then getting back into it recently, this stuff is still so valid. That’s why it’s important that they keep going.